Innovative and intelligent products of world renown are created at the company's own development centres in Germany, the Czech Republic and Switzerland. All products are manufactured by company-owned factories in Germany, Switzerland, Romania and Moldova. Made in Europe is STEINEL's formula for success. Infrared or high-frequency – with STEINEL Professional, intelligence is built in as standard Our range of motion detectors covers the entire spectrum of demand in professional applications: versatile and system-based – cleverly designed and practical to use. 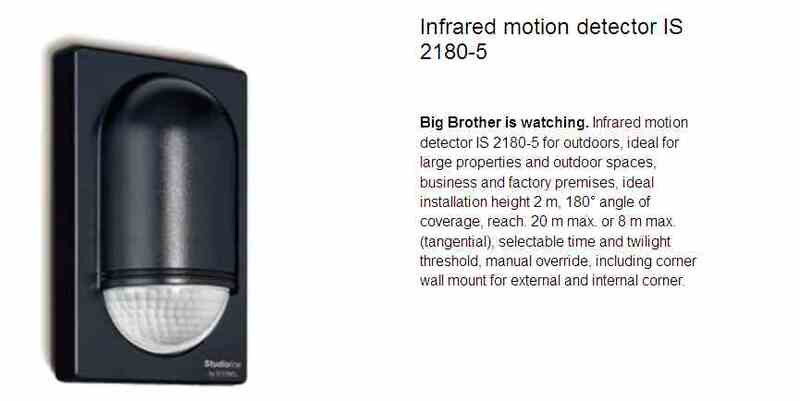 Technology of the next generation Compromising on nothing, we have developed our motion detectors for professional needs. Innovative technologies, such as the multi-lens and multi-sensor technology as well as the astonishingly high number of switching zones and detection levels provide maximum accuracy to ensure precision coverage. Using infrared or high-frequency sensors, our highly advanced sensor technology reliably detects movements anywhere in the detection zone. 100 % made by STEINEL Professional. 100 % German Quality – made in Europe. Motion and Presence Detectors The chief difference between motion and presence detectors lies in their detection properties and areas of use. The particular situation determines which technology is used where. Dynamic means effective: Motion detectors Motion detectors respond to walking movements. They perceive these in the selected detection zone and respond to them: this means light is switched 'ON' when a movement is detected once ambient light levels fall below a preselected threshold. Light switches 'OFF again after the period you set. Their use is recommended for detecting moving objects outdoors or in thoroughfares indoors. We have taken a thorough look at the demands that are made on sensor technology today. In addition to the expectations users put on them, we also devote our attention to those of planners, architects, consultants and electrical fi tters. After painstakingly and exhaustively analysing the market, we can meet the expectations placed on modern sensor technology with solutions tailored to every specific need. 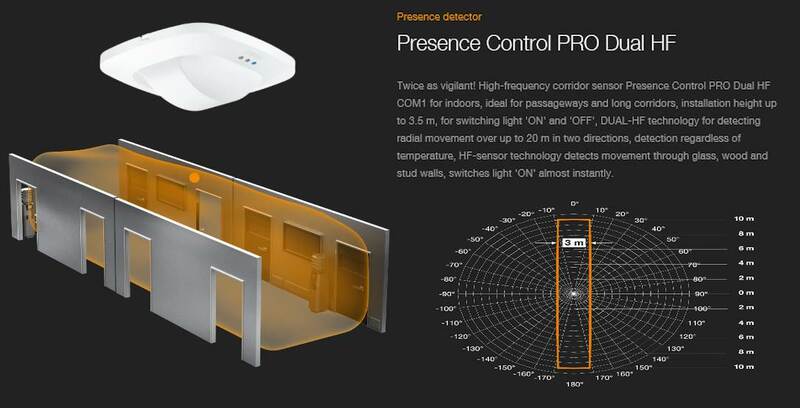 The result: our Control PRO generation of presence detectors. The Professional line-up: covering a range no other can The Control PRO System uses 4 sensor technologies, 2 infrared versions and 2 high-frequency versions. Both infrared presence detectors have a mechanically scalable square-shaped detection characteristic – unparelleled anywhere else in the world. The design of our new Control PRO family is understated. This range is intended for recessed ceiling installation and therefore extremely shallow. They go perfectly with square as well as round ceiling elements and lights. A range of accessories also permits surfacemounting. Needless to say, our presence detectors are available in all the most commonly demanded combinations (switching output, HVAC output, 1 – 10 V dimming output, KNX/EIB, DALI). Featuring additional functions and setting capabilities, they can be used in master/slave applications and benefi t from a self-learning IQ mode. They can also be operated by IR remote control. A precision constant-light controller is, of course, also integrated. Alongside presence detectors, the Control PRO System also offers modern DUAL smoke detector and an air-quality sensor covering all demands on building sensors in matching design. That's STEINEL Professional – Intelligent lighting for professional applications. Light that thinks for itself The indoor light series from STEINEL combines state-of-the-art sensor technology with sleek design. Cutting-edge high-frequency sensors (HF) invisibly concealed inside these lights instantly respond to the tiniest movement regardless of temperature and automatically switch 'ON' light. STEINEL HF-SensorLights are designed specifically for indoor spaces, such as stairwells, corridors or bathrooms. The innovative lights come as wall and ceiling lights. 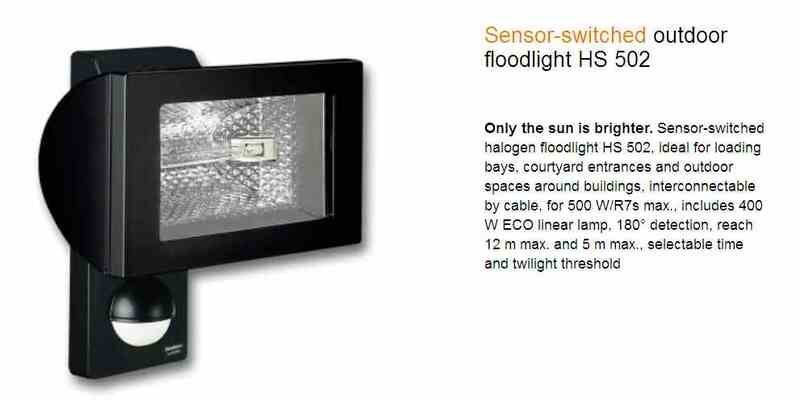 HF-SensorLights provide efficient, money-saving light management as well as added convenience and safety in the home, commercial premises, administration centres and other buildings. Another reason to make investors and homeowners decide in favour of STEINEL HF-SensorLights: the intelligent light is just as easy and quick to install as conventional lamps - and there's no need for separate switches or motion detectors. One example illustrates the efficiency of HFSensorLights: When you enter the stairwell of a multistorey building, for example, the sensors integrated in the lights only switch the light 'ON' when it's really needed – and 'OFF' again after the time you set.Floors that are not used stay unlit. Light 'ON' and 'OFF' ...automatically High-frequency sensors respond faster Wherever there are people, there is movement. This fact makes motion sensors the ideal cornerstone for intelligent lighting. STEINEL high-frequency (HF) sensors identify movement instantly without any restriction to "sensitivity" through ambient temperature and direction in which the object being detected moves. High-frequency sensors actively scan the detection zone. To do this, they emit signals and receive the echo reflected off walls and surrounding objects a moment later. Any movement is immediately detected and the light is switched 'ON'. And there's no more forgetting to switch the light 'OFF'; it does that all by itself. Saving energy. STEINEL high-frequency sensors operate at 5.8 GHz. As glass and thin walls do not get in the way of these signals, the sensors can be fitted inside the light, making them invisible from the outside. This way, nothing detracts from the design of STEINEL SensorLights. These qualities make the STEINEL HF-sensor the perfect solution for automatic indoor lighting. An innovation from STEINEL – the original. Convenience, safety, lower costs Employing state-of-the-art high-frequency sensors to control interior lights as and when they're needed, STEINEL has heralded in a new era of lighting automation. STEINEL HF-SensorLights are specifically designed for indoors and can be mounted to walls and ceilings. Reach setting STEINEL HF-SensorLights can detect movements across a diameter of 1 to 8 m.You can infinitely vary the reach you require using the system's electronics. Time setting STEINEL HF-SensorLights are equipped with a timer that makes sure the light stays switched 'ON' for a selectable period of time even after a temporary movement in the detection zone. You can infinitely vary how long you want the light to stay 'ON' for. Twilight setting Setting the response threshold to between 2 and 2000 lux, you can determine the level of ambient brightness at which you want the SensorLight to come 'ON'. While it's still light, at dusk or when it gets dark. Straightforward installation STEINEL HF-SensorLights are just as easy to install as conventional light fittings: Fix light to wall or ceiling and connect phase and neutral conductor to the screw terminals – that's all there is to it. It's just that now, with integrated sensor system, there's no need to do any switching by hand. Connecting other loads The HF-SensorLights are provided with a separate terminal that can be used for connecting other devices. On entering a guest WC, an addition light or extractor fan can, for example, be switched 'ON' in addition to the main light. Energy efficiency can look as good as this These days, outdoor lights with integrated sensor technology are part and parcel of contemporary lighting planning. These intelligent lights combine the greatest possible energy savings with maximum convenience and enhanced security throughout the building. SensorLights from STEINEL are just as quick to install as conventional lights and are available in many attractive designs and configurations. This is where STEINEL innovations, like the mini-sensor, permit design solutions with perfectly integrated IR-System, improved detection properties and optimum user convenience. Ecologically and Economically Intelligent: Sensor-Switched LED Floodlights Our top-performing XLed sensor-switched fl oodlights set standards in effi ciency. Outdoor lighting makes up an important aspect of planning, particularly for large open spaces and expansive properties. This is where the best possible cost-benefi t ratio takes top priority. An automated lighting system geared exactly to providing light when it's needed goes a long way towards saving energy and, with this, also costs. 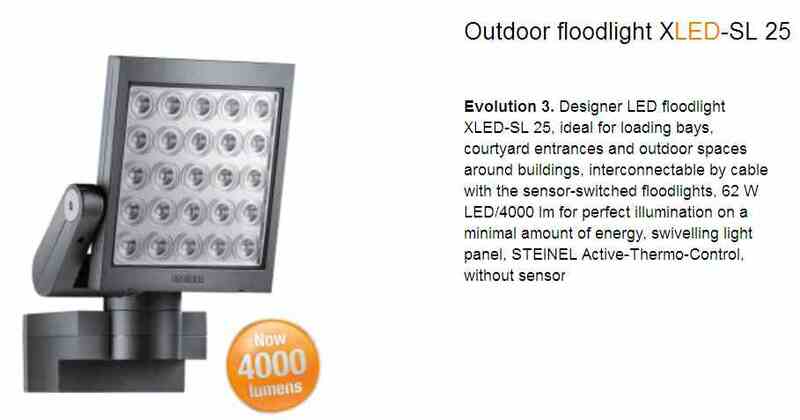 The XLed-sensor-switched fl oodlights from STEINEL Professional combine high-quality sensor technologies and LED light. The range systematically demonstrates that effi ciency is a matter of technology: this being 100% LED light requiring only about a third of the energy used by halogen fl oodlights. That speaks for itself. The challenge with high-performance LED fl oodlights of this type (at up to 60 W) lies in heat management. Our answer to this: ATC. We achieve optimum heat dissipation through our cooling fi ns as well as from our patented Active-Thermo-Control system. The temperature of the LED’s is measured continuously. Action is taken in critical situations, all controlled by microprocessor and going unnoticed by the user. Only this way can the high-performance LED’s be guaranteed to last their full life expectancy.